Everything you need to brew Kombucha at home - just add water! Our Complete Continuous Brewing package is the perfect choice for beginner and seasoned Kombucha brewers alike. In addition to our fresh, never dehydrated 100% organic SCOBYs, our Complete Continuous Brew Packages come with your choice of brewing vessel, a brewing cap, thermometer strip, Hannah's signature tea blends, access to our instructional videos and Platinum Kommunity support forum, and much more! With the Complete Continuous Brew Package, brewing Kombucha at home couldn't be simpler or more convenient. We strive to make home brewing Kombucha as fun and easy as possible, right down to offering packages that have all the supplies and equipment you need all in one place. 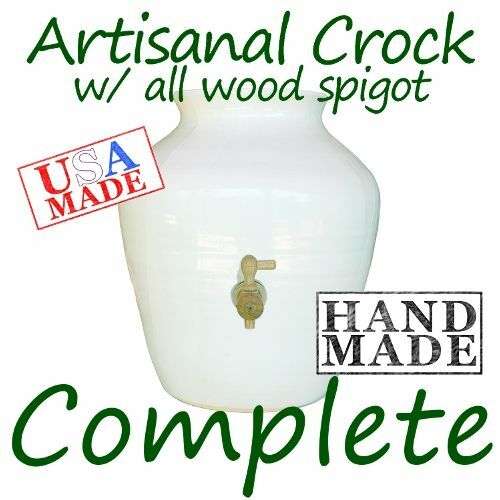 Stoneware Brewing Vessels - these artisanal stoneware crocks are 100% handmade in the USA from all-natural brew-safe materials. 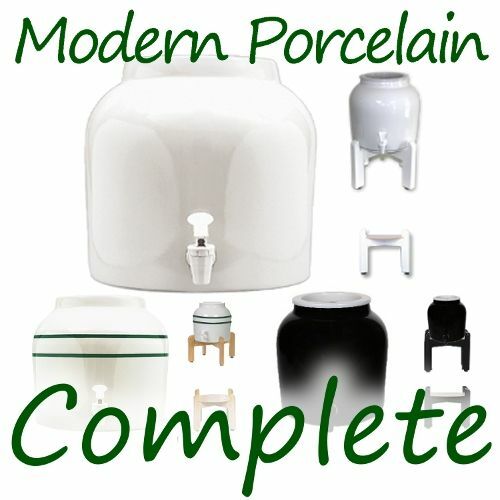 Porcelain Brewing Vessels - modern porcelain brewing vessels are a popular economical choice for first-time brewers. 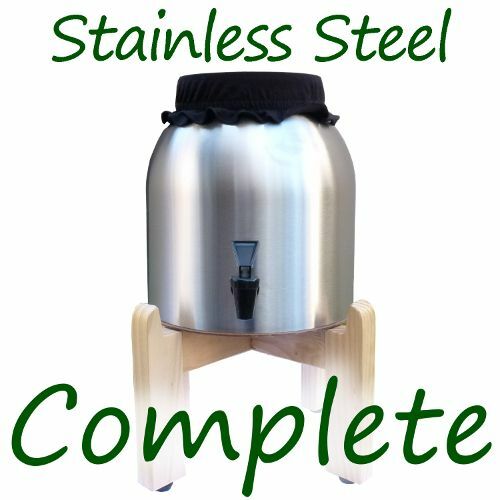 Stainless Steel Brewing Vessels - made from the only brew-safe metal for Kombucha brewing, our stylish 304 grade stainless steel brewing vessels are lightweight and sturdy which makes for easier cleaning. 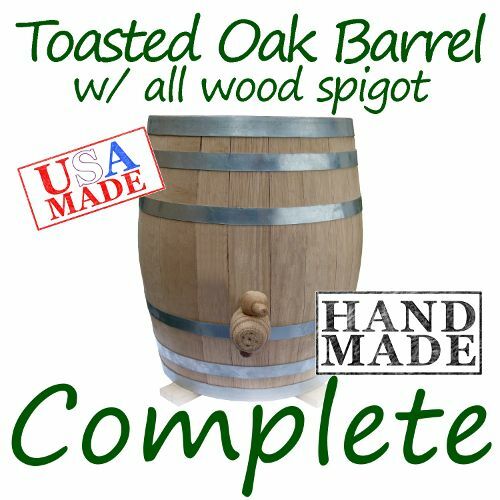 Toasted Oak Barrels - for a truly unique Kombucha flavor, our toasted oak barrels impart a unique flavor that you just can't replicate with other brewing vessels. 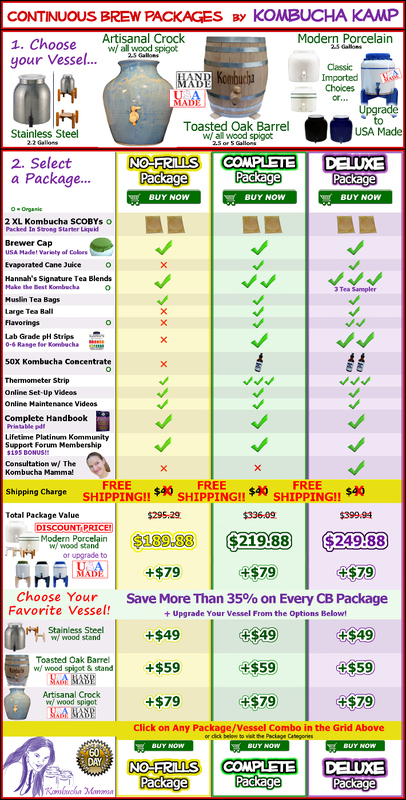 If you're not sure which one is right for you, please review our Kombucha brewing vessel list for more information. What kind of tea is best for Kombucha? Just about any type of tea that comes from the Camelia sinensis plant is suitable for brewing Kombucha. This includes black, green and white teas. The tea that comes from Camelia sinensis leaves provide nitrogen, caffeine and nutrients which, along with sugar, helps create a healthy environment for producing a vibrant, tangy Kombucha brew. Though you can use some types of herbal infusions (called tisanes) to brew Kombucha, herbal varieties do not contain the nutrients that the culture needs to thrive, so you may notice an herbal Kombucha brew will show signs of weakening over time which can lead to diminished flavor and poor SCOBY growth. The best way to keep your culture thriving is to run a non-herbal tea cycle in between your herbal Kombucha cycles to reintroduce those nutrients and prevent die off. You should also be cautious with the types of herbal infusions you brew your Kombucha with as they may contain oils that have a bactericidal effect (which will degrade the Kombucha brew over time). Try Hannah's Special Tea Blend here. How long should I let the Kombucha ferment? We get this question a lot and there isn't a one-size-fits-all answer. Since there are a lot of variables that can affect the flavor of your Kombucha (especially temperature), it is best to follow your taste buds. It may take a few brewing cycles for you to determine the length in which you should brew your Kombucha but when it's ready, your palate will let you know. Grab a straw or draw out a small amount in a cup and give your Kombucha a quick taste. If it's too sweet, you may need to give it a day or two (maybe even 3) to give it more time to ferment. Keep in mind that a SCOBY can’t be "ruined" by putting it through a long brewing cycle. Although a long brewing cycle will result in an extra-tart Kombucha, even if you let your Kombucha turn into vinegar, there are still ways it can be put to good use. One of the many joys that come from brewing your own Kombucha is the experimentation process so don't be afraid to test out new ingredients and cycle lengths. While you can certainly use run of the mill white granulated sugar, we recommend avoiding any types of sugars that contain residual chemicals or pesticides that could introduce impurities to the Kombucha tea. For this reason, we recommend organic sugar but not all sugars are the same. For instance, the typical white granulated sugar found at the grocery store may not be made from cane sugar but rather from beets. While there's nothing wrong with using white sugar to brew Kombucha, we prefer to use organic, evaporated cane juice in order to avoid introducing any unwanted chemicals. There are different types of cane sugar too. Many of the types of cane sugar that are ideal for brewing Kombucha tea (e.g. Turbinado, Demerara, Muscovado, Piloncillo, etc.) have a higher mineral content than "white sugar" which makes it more nutritious and provides a healthier environment for the bacteria and yeast to transform the sugar into healthy acids like acetic, glucuronic and hyaluronic acid. There are other sources of sugar that you can use to fuel your Kombucha culture as well, including Molasses, Agave syrup, maple syrup and even (non-raw) honey! Learn more about the different types of sugar to use for brewing Kombucha here! What is the best temperature for brewing Kombucha? The ideal temperature for brewing Kombucha tea is 78-80F degrees (25-26 C degrees). Unlike the fermentation cycle length, the temperature that is best for brewing Kombucha is a lot easier to gauge. However, it's very important that you monitor this since fluctuations in the temperature can greatly affect the fermentation of your Kombucha. The warmer the temperature, the faster it will ferment so you may need to place your Kombucha brewing vessel in a dark, cool location (like a pantry or cupboard) to keep it from brewing as quickly. Conversely, the colder the temperature, the slower it will ferment and you may need to provide additional insulation (brewing tees are perfect for this purpose) or adding a source of heat (e.g. a Kombucha heating pad).